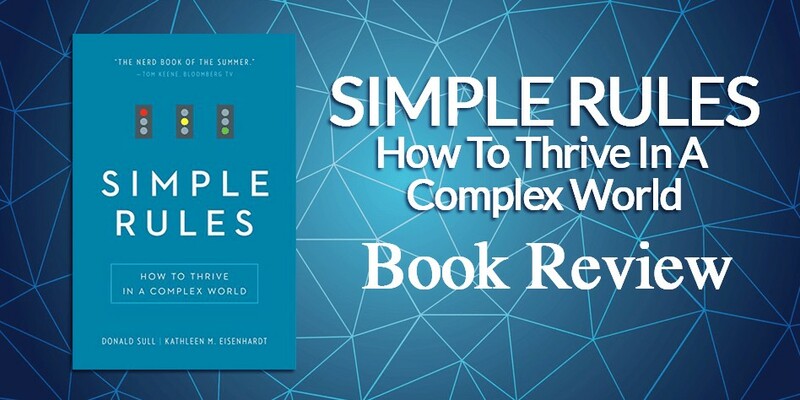 I have no idea what inspired me to pick up “Simple Rules: How To Thrive In A Complex World” on Kindle and Audible, but I’m stupidly glad that I did. I’m going to ruin this review right now by saying if you haven’t read this book, click here, go buy it right now and read this book! It is easily, without question the best book I’ve read in a couple years. There aren’t many books that make me stop and think about how I can apply what the author is saying while I’m reading the book, but Donald Sull and Kathleen Eisenhardt have managed to pull it off. Allow me to give you and example… What do Tina Fey and the act of Hilltopping by butterflies have in common? Both are guided at a fundamental level by a set of simple rules. These simple rules have allowed Tina Fey to go from a no-name improv comedian to writing for Saturday Night Live, starring in the show, bagging tons of Emmy awards for 30Rock and starring in a bunch of movies. Certain species of butterflies use a technique to find a mate called “hilltopping”. These butterflies lead very short, isolated lives so to mate they have a small window and they need to get to a place where other butterflies are. Scientists studying these butterflies have discovered an uncanny set of rules govern their behaviour. They scan a direction, find the highest point, fly to it, look for other butterflies and if they find none, they start looking for a nearby high point to go to. It’s very orderly and systematic. Their simple rules guide them to successfully mating in a very efficient way. On and on it goes… Everywhere you look, you see simple rules guiding things. In and of itself, those things are just a fascination, they’re not particularly useful. The real leap came for me almost subconsciously. I found myself thinking about my own businesses and how I could apply a series of simple rules to what I’m doing to make everything more effective, focused and easier to run. The book goes into the six types of rules, three that are fairly simple and three that are a bit more complex. The first three simple rules are: Boundary Rules (yes/no type decisions), Prioritizing Rules (ranking things) and Stopping Rules (don’t do certain things). The next three more complex rules are: How To Rules (doing things in a controlled way but with room for creativity), Coordination Rules (things that tie other pieces together) and Timing Rules (defining when things should happen). When you look at a situation in your business, you can easily find a number of opportunities to use simple rules to improve the way you do business. Let me give you a couple of “timing rule” examples. The faster your respond to people enquiring about your services and giving them the information they are looking for, the more likely you are to move them towards a sale. Here’s another related “timing rule”. Sometimes people get busy and they need a gentle reminder to respond to you. Give them three days and reach out to them again to let them know you’re still interested in doing business. However, if they fail to respond to your follow up, then let it go – there’s no point wasting effort chasing leads that aren’t interested and some people just would rather ignore you than tell you “no”. Those are simple rules that you could probably apply to your business today and become more efficient with how you do things. These were the kind of things that started popping into my head while listening to the book. Uh, yeah! Duh! This book is amazing right from the start! In fact, “Simple Rules” just kept delivering more and more value as it went on. Towards the end of the book, they go into more business related case studies from the companies they’ve worked with applying this strategy of simple rules. The results are incredible, but it’s just the simplicity with which complex situations are able to be broken down into easy to follow principles. We all have a tendency to overcomplicate our businesses. We think we’re being clever or that our business is a “special case” that needs complex processes to run properly. The reality is, every business can be run using a set of simple rules. I think I’ve recommended this book to about ten people in the last week – it’s the best thing I’ve read in a long time. I highly encourage you to pick this book up!